This revolutionary party does not contest in elections and is the best example to prove its sturdiness towards social reformation alone. Even amongst several changes in the political and social scenario, Dravidar Kazhagam has a huge mass of dedicated followers. Doubtless, the party has reached great heights today under the able guidance of Thiru. K.Veeramani, who has well balanced the party without hampering the ideologies of his mentor, Thanthai Periyar. Dravidar Kazhagam was started with the prime motto of eradicating the ill practice of caste system and to unleash the mass from the clutches of false beliefs. The Justice Party's provincial conference held in Salem on 27th August 1944 marked as a turning point in Thanthai Periyar's movement. The name of the Party was changed from Justice Party to Dravidar Kazhagam. During freedom struggle, the followers of the party withdrew their positions and titles adored by the British Government. They also gave up caste identities that followed their names. During this period, the party decided that none of its party members would contest in government elections. Dr.Veeramani was one of the speakers of the meeting when this futuristic and revolutionary agenda was determined. After the physical demise of Thanthai Periyar, all the members elected Annai Manniyammaiar as their leader (06.01.1974), while Dr.Veeramani remained to be the party’s General Secretary. The party vowed to continue their mentor’s mission without falling prey to any temptations. Manniyammaiyar often lead protests against inequalities and superstitious practices that created waves of impact over the society. One such protest was that against the celebration of Ramleela in Delhi that portrayed the original inhabitants of India as demons and animals. Manniyammaiyar took a different route, as her protest against Ramleela fell into muted ears. She organized a celebration instead, on Ravana Leela at Chennai which deeply agitated the government and lead to the arrest of Manniyammaiyar, Dr.Veeramani and many other party members. The party conducted many such protests and rallies, though judicial threats played a regular role in withholding permission to their reformative activities. Still, nothing hindered the party’s motto and the members continued with their campaigns under the principles of Thanthai Periyar. 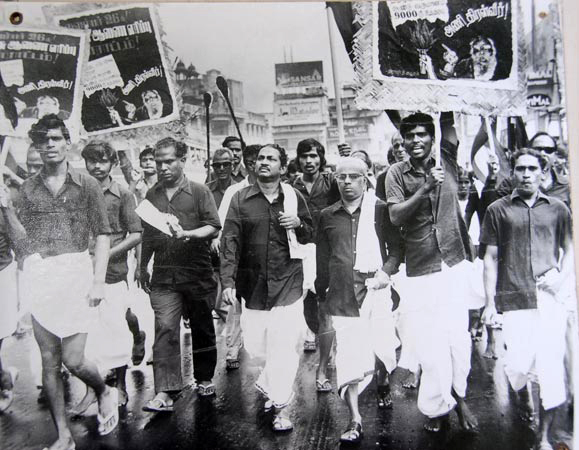 Protesting against the inequality of rights that prevented some from entering the Temple Sanctum, Maniyammaiyar lead a protest displaying black flags to Union Ministers that lead to mass arrests. On 31st January 1976 the ruling DMK government was dismissed and the state was brought under President’s rule. Dr.Veeramani and several others were put behind bars under the pretext of Maintenance of Internal Secrutiy Act ( MISA). In the prison, he was brutally beaten when he voiced against the assault of his co- detenee.. The party’s Tamil Daily “Viduthalai” was put to severe censorship and public meetings were banned. Even during this devastating situation, he advised his fellowmen that such brutal activities shouldn’t be permitted to dilute their spirit of reformation. On the other hand Manniyammaiyar toured various parts of the state and met party people in indoor meetings and encouraged them to proceed with their service to the society. The government even banned the celebration of Thanthai Periyar’s birthday. The party under the leadership of Manniyammaiyar displayed black flags to the Former Prime Minister, Ms. Indira Gandhi, as a protest against the atrocities of her government during the period of emergency. Manniyammaiyar along with Dr.Veeramani and others were detained due to the protest. While in prison K.Veeramani lost his father Thiru. C.S.Krishnaswami. To add more grief, he also lost Annai Manniyammaiyar on 16th March 1978. This was one of the hardest periods of Dr.Veeramani’s public service. Though he was heart broken, Dr.Veeramani mustered his strength to retrieve from the situation. During this period, where the party needed a strong leader, Dr.Veeramani was elected as the General Secretary of Dravidar Kazhagam, aand he meticulously following the principles of his mentor and keeping the flame of rationalism unwavered.